Places of Fancy: Where Is 'Silent Hill'? This New England town is so sleepy it's devoid of people. Population 0, it's not, for it has inhabitants—just not the merciful, let alone human, kind. Mystery shrouds Silent Hill just a bit less than the copious mist wafting from nearby Toluca Lake and blocking sunlight over town. History tells players of the eponymous game that Silent Hill was the site of occult rituals before the Europeans settled the land. Gamers have speculated Silent Hill must be located somewhere in Maine. The 2006 movie adaptation puts Silent Hill expressly in West Virginia, but everybody knows where the filmmakers really think it is located. Led by screenwriter Roger Avary, the filmmakers visited Centralia, Pennsylvania for inspiration. Much like Sunnydale, the town of Centralia literally sits on hell. For reasons still unknown, a strip-mine pit caught fire in the early 1960s and the inferno spread to the coal mines beneath town. 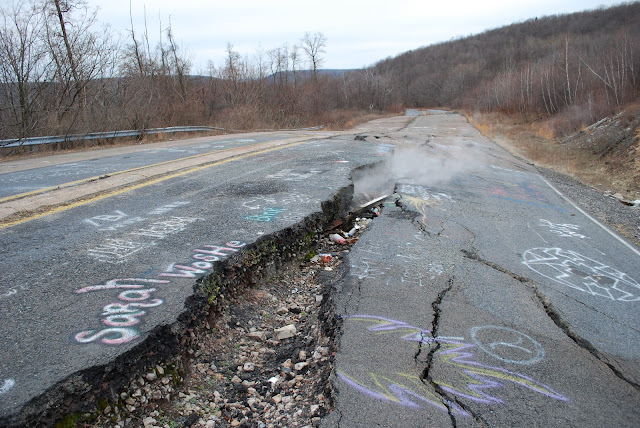 By 1984, Centralia was pronounced uninhabitable. Toxic gases would shoot from roads and the hollow earth would literally swallow living people at random. This subterranean conflagration has not abated to this day. Centralia even got Silent Hill's smoky effect right. Now Silent Hill may have its cold-blooded monsters and cults, but the air in Centralia is killer by itself. That is, if the brittle earth doesn't eat you first.